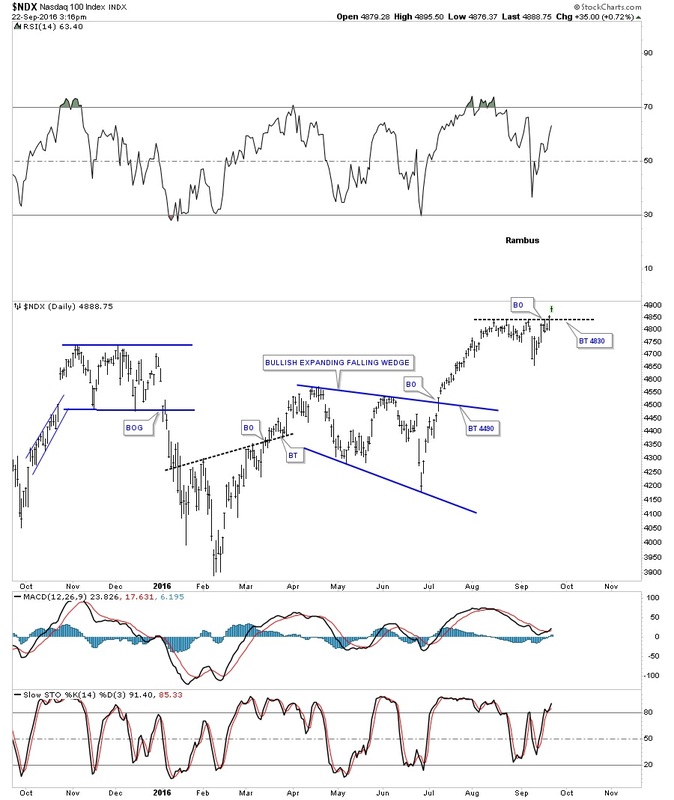 NDX 100 Update…Big Cap Tech Breakout? 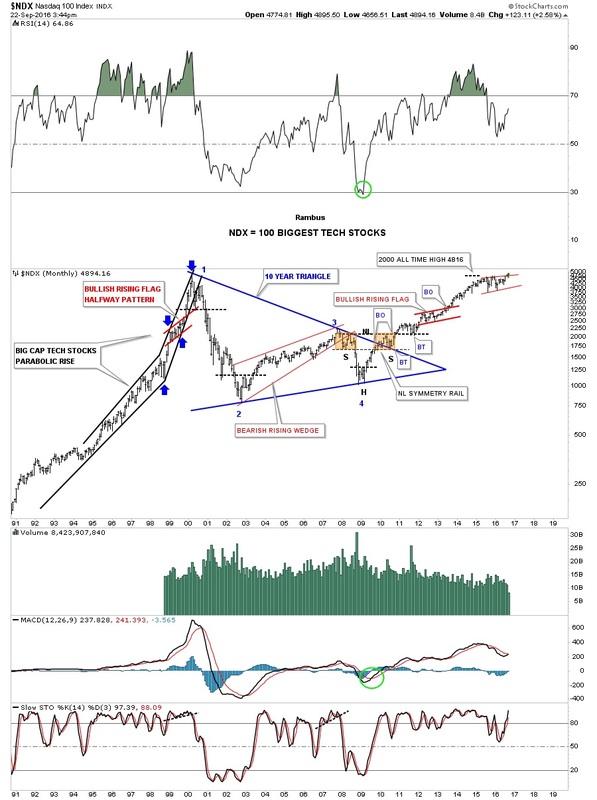 Below is a daily chart which shows the NDX 100 big cap tech stock index trading at a new all-time high yesterday. The breakout on the monthly chart. Before I discovered the junior PM stocks in 2002, the big cap tech stocks is where I played especially during the 1990’s. The real move for the tech stock actually began in 1995 where the final parabolic move started into the 2000 top. You can see the red bullish rising flag that gave me a very good clue to look for a top at a minimum or some type of consolidation pattern to start to building out. Things were extremely bullish back then and to be looking for a top was off most investors’ radar screens at that time. Luckily for me I got out close to the March high as suggested by the red bullish rising flag halfway pattern, measured by the blue arrows. Once the price action broke below the horizontal black dashed line that marked the beginning of the bear market that would wipe out most investors that didn’t sell waiting for higher prices. That bear market also devastated many of the high flyers that never came back. That 2009 low ended up being the head of a very large symmetrical H&S bottom. 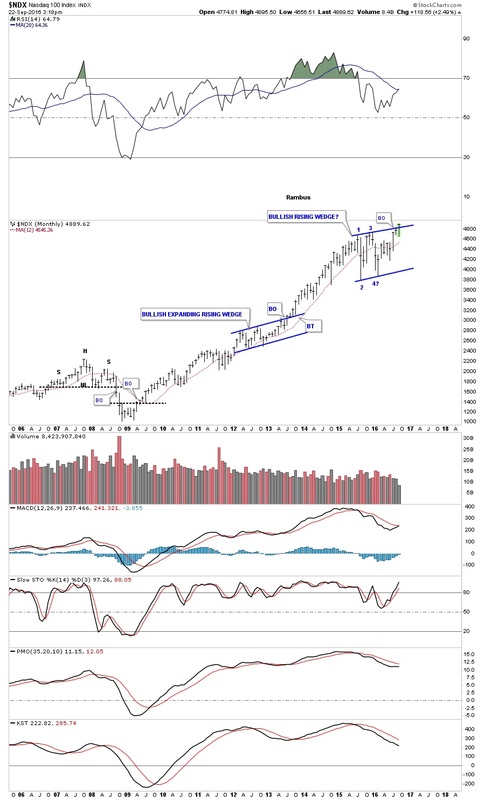 The bull market that started in 2009 has run unabated for over seven years now and it looks like it’s getting ready for the next impulse move higher and is now trading at new all-time highs. Most see a huge top but I see a consolidation pattern that is breaking out topside. Remember patterns that slope up into the direction of the main trend instead of against it, shows strength. Note the previous red bullish rising flag that formed in the uptrend. During this latest consolidation period note how low the RSI has fallen back to almost the 50 area while the price action is making new all-time highs. The energy is there for this big cap tech stock index to begin its next impulse move higher IMHO.